This is a mix of pee-wees of the fancy styles in this size. These pee wee marbles are approximately 10-13mm or 1/2" and smaller in diameter. 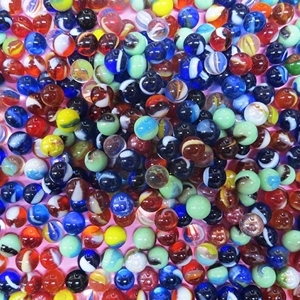 These marbles are sold by the pound or 5.5 pound bag. The 5.5 pound bag has approx. 1000 marbles. Quantities of each style of marble will vary. Colors may vary slightly from the photo. There are approximately 170 - 190 peewees in a pound. Sizes will vary slightly. Large orders can take up to an extra week to ship depending on availability. Warning! : Choking Hazard. This toy is a marble. Not recommended for children under 5 years.